Writer/director Noah Baumbach's work often leaves me feeling "meh." He got raves for The Squid and the Whale and while I thought it was alright, it didn't leave any lasting impression on me. His follow up films, such as While We're Young and Frances Ha, had even less effect on me. So when I say The Meyerowitz Stories (New and Selected) is his best work yet, that may not be the highest of praise. 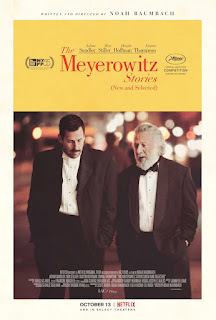 But The Meyerowitz Stories is in my opinion his best work. It is about fathers and sons and has a very smart script which keeps the audience engaged. Dustin Hoffman is classically perfect as the matriarch and the women in the film are all remarkable from Emma Thompson to Elizabeth Marvel to Grace Van Patten. But there are weaknesses here too. The biggest for me have to do with taste. I never can really buy either Adam Sandler or Ben Stiller in serious roles. They never hit the mark for me and neither does here. The script is snappy and funny and there are great moments when they get to be funny. But it's a cerebral humour which is neither of their strengths and so I never felt either knocked it out of the park. Hoffman and Thompson, and remarkably Marvel are the truly hilarious parts of the film, and they also offer more pathos too. The ending, or climax fells flat for me mostly due to Sandler. The movie builds to this one moment, a moment which seems to need to cap off everything that has come before and I felt Sandler fumbles it. But Baumbach's script, while my favorite of his so far, is also not always pitch perfect. It suffers from the relatively common problem of having people say stuff out of the blue to explain their feelings. He covers this mostly by making it seem like a family trait so it doesn't feel quite that overt. But it remains something that pulled me out of the film. What I did appreciate is the way Baumbach's script, so interested in the father/son dynamic, is often throwing at us little brilliant moments critiquing how tone deaf mean can be to the women around them. There is this great sense of male ignorance weaving its way through the film that is not only insightful but poignant due to where there film goes with its Cats in the Cradle themes. So for me this is Baumbach's best work. But I still feel he has a long way to go before impressing me.